This NiSi S5 150mm Filter Holder Kit is designed for use with a Sony FE 12-24mm f/4 G lens. It allows for the convenient use of up to two separately available, 150mm wide, 2mm thick filters along with an included circular polarizer without vignetting. This kit features an aluminum alloy filter holder that is pre-installed with two pairs of plastic filter slots, a configuration that accommodates two rectangular filters. Each slot is designed to grip an installed filter only along the surface of the filter's edges. Contact with a filter's front or rear-facing surfaces is avoided, particularly when using graduated filters whose effect can be adjusted to better suit changing lighting conditions or creative demands by sliding them up or down within a filter slot. Use of this NiSi S5 150mm Filter Holder Kit is easily accomplished by first sliding the kit's adapter ring over the integrated hood of a Sony FE 12-24mm f/4 G lens. 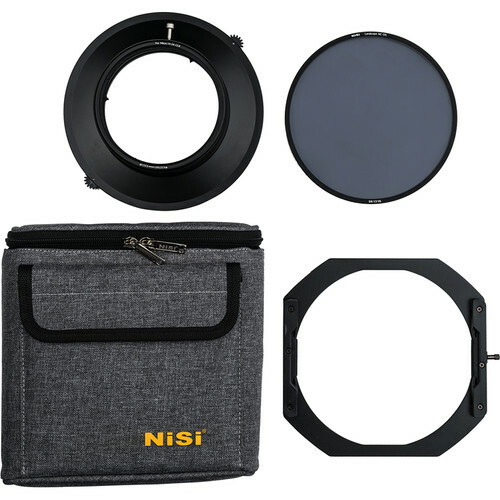 While its screw-in locking pin helps to provide a reliable connection to the lens, the adapter ring accommodates the included NiSi Landscape Circular Polarizer Filter for NiSi S5 150mm Filter Holder Kits. This circular polarizer filter is designed to provide a saturation effect that is approximately 25% greater than a NiSi Circular Polarizer Filter for NiSi S5 150mm Filter Holder Kits. When combined with the adapter ring, the polarizer filter can be rotated to adjust its effect. In such instances, an external dial on the adapter ring allows for the independent rotation of the circular polarizer. Box Dimensions (LxWxH) 8.6 x 8.6 x 4.6"
S5 150mm Filter Holder Kit with Landscape Circular Polarizer for Sony 12-24mm Lens is rated 5.0 out of 5 by 1. Rated 5 out of 5 by Bob from Excellent Purchase Initially, I was a bit concerned with making an investment that with filters equals the price of a lens. I watched more than my fair share of you-tube videos and finally decided to purchase this set and a six stop ND. The build quality is excellent. Extremely easy to install and take off. The polarizer works like a charm. Subsequently, bought a 10 stop ND, as well. I a really pleased with this product and have been using it frequently to learn. One cool after thought is I just put an order in for a 72mm adaptor ring. They dont yet have a 67 mm adaptor but I am thinking I can use the72 with a step down ring. However, the Nikon S2 does have more adaptor rings. I dont know what else to say other than the product is great and the lens quality is excellent, too. Can I use 100 x100 square filters with this holder? this filter is for 150mm lenses, it would not hold 100mm filters.